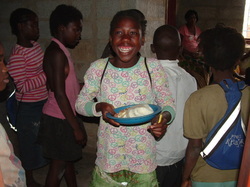 Sipewe is a happy young lady who always has a huge smile on her face. Her smile and engaging personality makes her so much fun to be around. Sipewe loves the camera and is always ready to pose! She has been with RHO Appleseed since we opened in our leased building in November of 2011. Sipewe has been living with both parents until very recently. Sipewe had a 6 year old sister, who passed away last night (Monday, Feb. 11, 2013.) The cause of death is unknown to us, we are told that she had been ill and the mother went to the village to get medicine. From what we can gather, this likely means that the mother was seeking help from a village 'witch doctor', although this is not confirmed. We know that, as of yesterday, her mother is gone and her little sister has died. Her father came to the school to tell Mary that he has been offered housing, by his employer, but the housing is outside of Bauleni and that he and Sipewe would be leaving in very soon. Sipewe does not want to leave Bauleni or Appleseed School. Mary, being the incredible woman that she is, has offered to have Sipewe move in with her. Mary has a small 2 roomed house. One room is a living room/kitchen area and the other is her bedroom. She currently cares for her granddaughter, Angel, who is 2 years old and her young cousin, Loveness, who is 12 years old. I asked Mary where Sipewe would sleep. She said, "With Loveness, in my room." While it is hard for Sipewe's father to leave her, he is so very grateful to Mary for making this offer. Mary told him that Sipewe is doing so well at school and that she would be very missed if he took her out. He replied that he is so grateful and surprised, he never expected someone to care so much for his child. I saw Sipewe today. While her English is not good, she does understand it pretty well. She is definitely mourning the loss of her little sister, but she is happy that she does not have to leave the school and people she has come to love. Her father was going to pack her things and bring her to Mary's this evening after school. He will manage to see her on the weekends and this, we hope, will be a permanent placement for her. Mary is committed to her. As I have said in so many other posts, people here live very hard lives. But, they are the most resilient and kind people that I have ever known. I believe that Sipewe will grow into a smart and happy person with the help of the loving staff at Appleseed, Mary and her sponsor. Pictures and movie of Sipewe's day of shopping coming soon!